Every so often a show comes along in a whirlwind of media attention and hype and, I'm not going to lie, I'm pretty good at getting in its path and being swept away. I give you "The Book of Mormon"
With excitement I booked my tickets soon after it opened, but being a self-confessed pernickety theatre-goer, I'm quite particular over where I like to be sat. To have, what I consider, "good" seats I would have to wait 6 months. So the impatient wait began. I listened to the soundtrack almost every day. I was already in love. People do ask if I think it spoils the experience, listening to the songs before seeing the show and so often. To be honest, I didn't even consider that - I was too anxious to be part of the whirlwind. 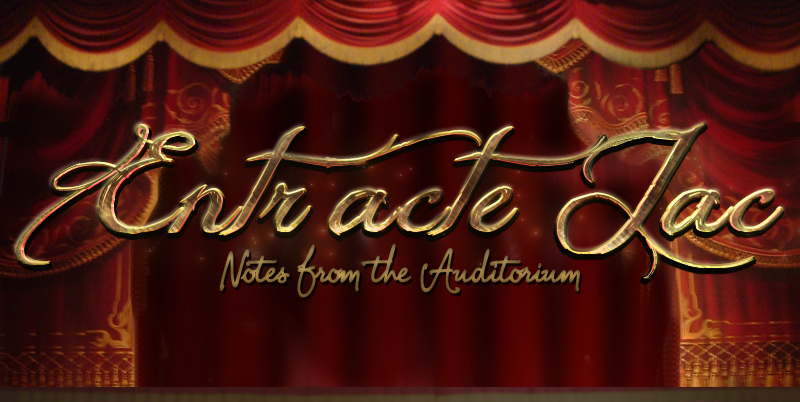 Besides, I listened to Phantom of the Opera and Les Miserables for years before seeing them for the first time and I was absolutely blown away when I did see them on stage - if I hadn't been, theatre wouldn't be as central to my life as it is now. My point is, that I built it up a lot. Half my year was building towards this. This is a show that appealed to my (non theatre loving) friends too, so having them come along made me feel the pressure - what if they'd spent all that money (the tickets aren't cheap!) and didn't like it. It was, therefore, with a nervous excitement that I entered the auditorium of the Prince of Wales Theatre. We were sitting in the second row, just off centre. I had been panicking that these seats may be too close and how it would affect sight-lines (I had a bad experience in the front row for Love Never Dies at the Adelphi - the stage was very high and I am very short). Rest assured, these are great seats. The stage is low enough to not have the actors cut off at the waist - or disappear entirely upstage and you almost feel part of the show being spitting distance from the stage - literally. Take umbrellas. Generic person: What are you going to see this time, then? Gene: Oh. (sceptically) A show based on the Book of Mormon? This is pretty much how I feel about writing this now. You just have to see it. There's nothing I can say that'll convince you without, at worst, spoiling anything or, at best, give the magnificence of it a dull sheen. What I will say was that I smiled and laughed throughout the entire show, to a point where my cheeks were aching by the interval. The show is the brain child of South Park creators Trey Parker and Matt Stone but also, someone who many people forget to accredit, Robert Lopez - the creator of the similarly controversial Avenue Q. It's not all about shocks and laughs though. There is a strong message, that is actually pro-faith, whatever your faith may be and there is real heart to the show that leaves you with that tingly uplifted feeling. I'm going to steal a quote from Rory O'Malley, the original broadway Elder McKinley, here. He said in an interview "The real shocking thing about the show is the heart" - nail on the head. I was expecting the crudeness and controversial statements - we've all seen South Park. What I didn't expect was to be so moved by the story. I attribute this mostly to one character - Elder Cunningham. To me, his character is the heart of the show. He has this childlike wonder and enthusiasm which makes you forgive his naivety and ignorance in the same way you would of a 5 year old. Jared Gertner plays Arnold Cunningham expertly. He has balanced the irritating, clingy side of his character with the sweet, loveable side to the right degree. He's the stereotypical nerdy misfit whose quirks and imagination carve a place for him within the African community. But Cunningham's character wouldn't work without the opposing force of Elder Price. Described as the 'poster boy' for Mormonism - wildly dedicated to his faith with a burning ambition to share it with the world. 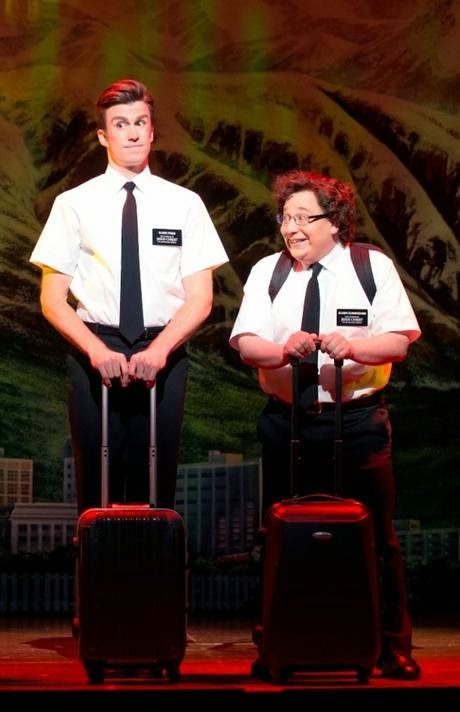 Gavin Creel looks the part - tall and athletic contrasted with Cunningham's short, rotund frame - and also plays Price as the perfect contrast to his missionary partner; rigid, focused and serious. Stephen Ashfield's Elder McKinley's massive, continuous cheesy smile alone has me laughing. It epitomises his character. Alexia Khadime's Nabulungi is naively accepting and sweet - this role seems a much more comfortable fit than when I saw her in Les Mis as Eponine, which then left me underwhelmed. I eat my previous words here - in this show, she is fantastic. Chris Jarman as the General was genuinely intimidating - his scene with Elder Price toward the end has me equally squirming and laughing. I could mention every single member of the cast here to be honest - from the leads to ensemble - everyone has found the 'heart' of their individual character. In the current, rather bland landscape of the West End, with it's jukebox musicals and safe revivals, this is a risky, refreshing beacon of an original, new musical and gives me hope for the future of theatre. I love it. Everyone I know who has seen it loves it. You will too. Book Now! 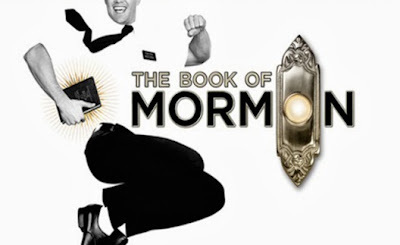 The Book of Mormon is currently showing at the Prince of Wales Theatre and booking until April 2014 (though, I'm confident this will be extended). Ticket prices are extortionately high, but if there's any show that's worth it, this is the one. I urge you to see it while Jared Gertner and Gavin Creel are still performing in it, too.